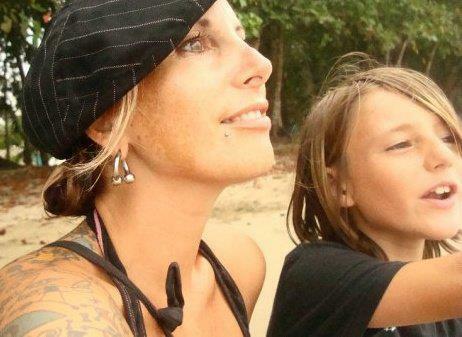 Could You Slow Travel The World For 8 Years As A single parent? Meet Lainie, a beautiful single mom and her son Miro who set out on a mission to slow travel the world letting inspiration be their compass. They started their travels in 2009 when Miro was just 10 years old and they intend to keep on travelling for a total of 8 years. Lainie and Miro are my 6th family to be featured in an ongoing series showcasing and featuring families and couples who are travelling full time or for extended periods of time. Lainie, was nice enough to take time away from her busy travel schedule to answer a few probing questions I had for her. You can follow along with their travels on their site www.RaisingMiro.com where they share their adventures from the road of life. Where: To date; Central and South America with inspiration as their compass. Length of travel: Travelling since 2009 with the goal of travelling for a total of 8 years until Miro (son is 18 ish). Challenges: letting go of the consumerist lifestyle, money. Finances or how they fund their life: Started out with a couple of years of funds from savings and selling their stuff but now rely on donations and advertising from their site. Lainie also founded Project worldschool– a temporary learning community where you can send your teen to gain the benefits of a group educational experience. It mainly attracts un-schoolers and world schoolers but all children are welcome. We have been slow travelling through Central and South America. To date, we have explored all of Central America and have visited Colombia, Ecuador and Peru. Our three year anniversary will be on July 1st, 2012. Want to celebrate with us? How long do you anticipate travelling for. Wow, that’s like asking me to plan for the future and that’s something I really don’t like doing. We have said we will travel until Miro turns 18 (and I subsequently will turn 50) but that’s just because the mind wants to have some criteria of gauging things. But in actuality, it’s an open ended trip and we travel as long as we are inspired to do so. Miro may not want to travel with me after 18 or he will and neither of us have no way of predicting the future. But I can say with confidence, this is our lifestyle of choice and it works for us. How Did Your 8 Year Travel Adventure Begin? I am a former California business owner who had worked in the advertising, marketing and branding industry for 20 years in total. In 2000, I started my own agency focusing on brand strategy, graphic design and messaging exclusively for green-eco companies, non profits and conscious business. One of the reasons I started my own agency was to remove myself from the destructive consumerist advertising world and do work for ‘good’. In 2008, the economy sank in California, so instead of choosing to struggle, I decided to opt for a change for both me and my son. I closed my agency, gave away (or sold in some cases) all of our possessions and set out to travel the world with my son. That was the opportunity we needed to live the life we were dreaming about, talking about and advocating for others. The real opportunity to make personal change. Today, 3 years in, we continue to choose travelling with no plans, no agenda, and inspiration as our only guide. Why did you decide to live this way? We sort of fell into the long term traveller’s lifestyle. Initially, we planned on travelling for one year, but as that year anniversary mark came closer and closer, we both decided to continue our travel lifestyle as long as we were inspired to do so. Before we set out, our perception of travelling was very different. Before we set out, we were in a ‘defining’ mind-set and it seemed very important for us to have a plan. Before we set out, it seemed scary and unknown. Before we set out we defined our travels ‘doing’, instead of ‘being’. But being on the road, our perception of life actually shifted and we have learned to live in the moment without the need for plans, that life and traveling were not scary at all, and it was ok to live at a slower pace guided by inspiration and doing the thing that bring us joy. What were or are your biggest challenges to living the way you do. I am not sure how to answer this. I suppose the challenges have changed as we’ve changed. In the beginning it was letting go of the consumerist lifestyle we were once accustomed to. We no longer measure our value through what we have, now we are more interested in having experiences together. We are always challenged with money as it relates to freedom, but at the end of the day, we always have enough. Other than that, living a life based on inspiration, no plans, no schedule and no stress does not really allow for many challenges. How do you deal with your day to day challenges? As all things, we deal with things as they come. Miro and I have learned to be really open and communicative about our feelings, wants and desires. We are experiencing the world together and we rely on each other. We also make all decisions about what we are doing and where we are going together. How would you describe the way you travel.. Slow travel, RTW travel, Nomadic or multiple ways? We do slow travel. Sure, you can call it RTW travel or nomadic as well. I don’t mind. But we like to call our style of traveling as visiting locals. We are visiting, but we are living in local housing versus staying in tourist accommodations. We eat local and play local and have a full immersion experience. We stay as long are we are inspired to stay, and pack up and go, when we are inspired to go. Can you tell me more about being a ‘global citizen’ (something you talk about a lot on your web site). I truly believe borders and boundaries are a thing of the past. There is only one citizenship that holds value, and that is “global citizenship”. I come from a background of activism, which I no longer subscribe to. In the past, I strived to change the world, make a dent is issues that mattered to me, usually surround civil rights, peace and the earth’s health. This activism was a huge part of my education in compassion. However activism strives to change the world from the outside. Through traveling with my son, I have discovered that all change happens from the inside out. In other words ‘being’ the compassion can effect the world just by virtue of being in the world. By being compassion and interacting and through interacting with the adults and children we encounter, we cannot help but to effect our collective future. Whether someone chooses to extend that further and volunteer, that’s fine. But it’s definitely not necessary. For us, we both have a lot of passion for animals and my passion for nurturing children has rubbed off on Miro through our latest volunteering experience, where we actually spent two months reading to children, getting them excited about stories and imagination and learned that Miro is a very good teacher. All of our experiences have been in one form or another of serving as we try to immerse ourselves within the communities we settle in. We live like visiting locals but no matter how hard we try we will never be mistaken as a local. So we embrace our differences and live each day with respect and gratitude for the communities we live in. Another way we immerse our selves is through learning as much as we can about the history and culture and local rituals, sometimes in the form of cooking, or learning about the local crafts and other times through volunteering. Most of the time though, the best strategy for immersion has been to participate within a given community by being present and connecting through smiles. How are you educating your son while you travel? As we started our trip, I had no idea such a thing called Unschooling existed. However I noticed Miro was talking about geography, sociology, history, economics, mythology, language and second language, literature, math, science. I sat back one night and realized how brilliant the idea of having the world teach my son was! Engage in life and children (and adults) learn! Soon thereafter, I discovered the formal name for what we were doing as ‘unschooling’. In some circles it’s called ‘Radically Unschooling’, ‘World schooling’ and Road schooling. There are similar principals to each of those ‘disciplines’ which is based on child-led learning. This is a radical departure form homeschooling circles that teach a formal curriculum only in the home environment. The philosophy behind unschooling is that children will learn what they need to know when they are ready and want to learn it and this flows through every other aspect of life. The whole essence of unschooling is that children, when empowered, will learn based on their individual interests. I’ve seen games spark Miro’s interest in mythology, quantum physics, history and culture. We’ve had an open platform to discuss humanity, violence, and choices because of video games. I’ve also seen Miro’s research skills improve as the internet and Google are second nature to him. I didn’t like going to the library to research when I was his age because it was so overwhelming for me. To have the library at your fingertips is a drastic change for this generation. I have discovered first hand that by virtue of being in this world, we can’t help but to learn. Children learn naturally and retain so much more when they are engaged and leading the process themselves. I realized this just by observing an empowered Miro blossom daily. As a result of my unschooling education, I am growing as Miro teaches me how to be a better and more effective parent in the process. I have written about unschooling extensively on our site, and I invite you and your readers to read more here. Lainie and Miro are my 6th family to be featured in an ongoing series showcasing and featuring families and couples who are travelling full time or for extended periods of time. An ongoing series showcasing and featuring families and couples who are travelling full time or for extended periods of time. Some travel just for a year while others have been travelling for more than 5. These are not lottery winners or rich people. They are just ordinary people like you and me who made travel their goal and decided to work at that goal to make it happen. I hope it inspires you to do the same no matter what your goals are. What do you think of Lainie and Miro’s story? Leave your comments below.